Business travelers are always a prime target for the cyber criminals and spammers to gain access to their computers and confidential data stored therein. Thus, before you go on your next business trip, make sure that you follow these important security tips in order to keep your system safe from any sort of vulnerabilities. Install Proper Security Updates And Patches: Before you leave for your journey, update the security software of the operating system and other applications for your computer. Also update the anti-virus software and if possible, enable it to update automatically. Although these processes may take a while, but it can prevent your system from security attacks by hackers. Download Updates From Authorized Websites: If your computer suggests you to update certain software or applications, do not click on the ‘update’ button straightaway. This can be a malware to install spam software in your operating system. To avoid this, you should go to an authorized website and download the updates directly from there. Always Use Virtual Private Network (VPN): Whenever you use the internet connection offered at public places such as hotels, airports and cafes, there is a higher possibility that your data can be intercepted and accessed unless it is properly encoded. This may include your username, password, documents and emails that you send etc. If your company provides VPN access, make sure you use it while traveling. Beware Of Free Access Points: Unsecured Wi-Fi access points may seem to be tempting, but they may be a trap set by the hackers to spy on your private data. Malicious hotspots can also be used to redirect the users to spam websites that can infect the computer with viruses. However, if you need to connect to the internet, make sure that you opt for Wi-Fi services that require a password for authentication. Encrypt Your Hard Drive: Your laptop may consist of some important business related data which may be at the target of cyber criminals. Make sure that your hard drive is properly encrypted and has a complete backup to keep all your information secure. 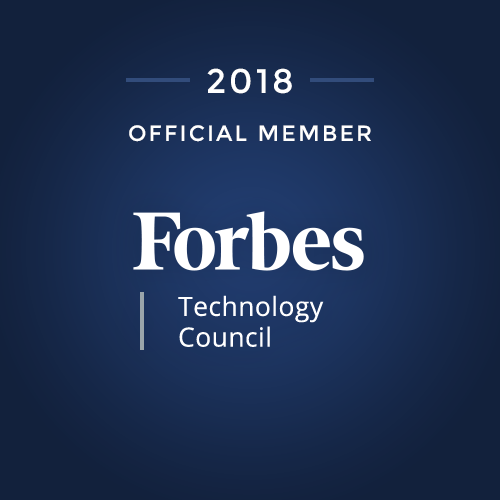 Avoid Using Public Computers: Computers in internet cafes and hotel business centers should never be trusted for any private communication or transaction. There may be a key logger installed to detect your username and passwords as you type. It is also advisable that you change your laptop’s password once you have returned from the business trip. 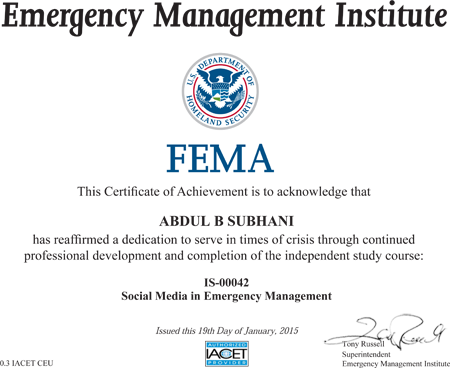 Abdul B. Subhani, Managing Partner of Centex Technologies, has successfully completed the independent study course in ‘Social Media In Emergency Management’. The course is offered by the Emergency Management Institute of Federal Emergency Management Agency (FEMA), New York. The purpose of ‘Social Media in Emergency Management’ is to provide the participants with the best practices to utilize social media technologies. This, further, helps them to improve the emergency response operations in their organizations. The Internet of Things (IoT) may be described as a network of devices connected to the internet to communicate and share valuable information. 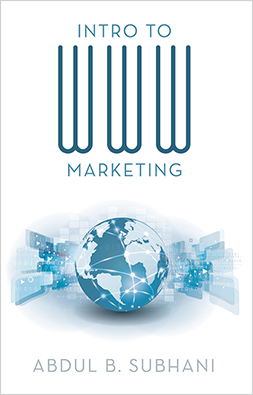 The concept entails internet connectivity beyond the traditional devices such as computers, tablets and smart phones to TVs, cars, electronic appliances etc. In a nutshell, every device that has an embedded technology to be able to connect to the internet comes under the category of Internet of Things. Privacy Issues: Most of the IoT devices collect personal information of the user such as name, date of birth, address, bank account, credit card details etc. More disturbing fact is that most of these gadgets still transmit these particulars over the internet without any encryption. Thus, it is highly possible that this data may be misused by the cyber criminals. Insufficient Authentication: There are many users who still rely on weak passwords that are short and easy to remember. A number of devices do not even require a strong password for the user to access the internet. Thus, it provides an easy way for the hackers to decode the password and penetrate the data stored. Web Interface: One of the common security concerns with the Internet of Things is issues in the UI including issue poor session administration, cross-site scripting and weak default authorizations. This allows the hackers to identify user accounts and manipulate them by resetting passwords. Insecure software: While downloading any software updates, most users do not use proper encryption. With such an error, the hackers can easily intercept these downloads and even see or modify them for their own benefit. Given the above concerns, the manufacturers of IoT devices must take the necessary steps to ensure the user’s security while being connected to the internet. After a year of facing some challenging cyber security threats like Shellshock (Bash Bug) and Heartbleed, experts have started to make predictions for security concerns in 2015. It is believed that besides traditional cybercrimes like data breaches and password attacks, many larger hacking attacks can also be expected this year. XSS Attacks: It is difficult to find high-risk vulnerabilities in credible web products, such as SharePoint, WordPress etc., however, low-risk vulnerability like XSS is quite common. As these attacks give the same results as an SQL injection, hackers usually prefer to exploit XSS to access confidential data. Third Party Plugins: Even though the core databases of many web products are quite secure, third party programs are at high risk for security breaches. Any outdated plugin can put the entire application at risk. Chained Third Party Attacks: Reputed websites are usually protected against critical vulnerabilities. Thus, it becomes easy for the hackers to combine several low to medium risk vulnerabilities to gain access to the websites. Ransomware Attacks: This is a type of malware that restricts a user to access the computer that it infects. It even demands certain sum of money to be paid to the hacker after which the restriction can be removed. The Internet of Things: Connecting your gadgets and devices like mobile phones, TVs or cars to the internet will also be a major cyber security concern in 2015. As these devices do not have any sophisticated security applications, it is much easier for the hackers to access important data and manipulate the system. 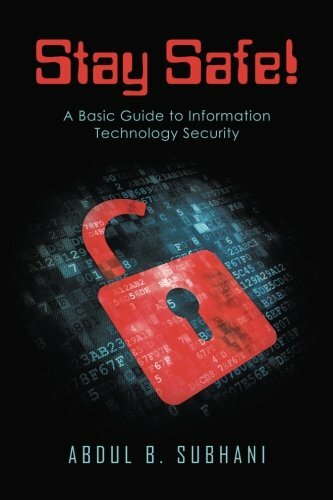 Cyber Espionage: Also known as cyber spying, this is a very common attack used by the hackers to get hold of confidential information illegitimately from a computer system. Point of Sale Attacks: With the introduction of Apple’s virtual payment system Apple Pay, cyber criminals will definitely look to abuse any flaws in the application. In addition, other digital payment systems on mobile phones will also remain the target of hackers. Blastware: This malware destroys operating systems, deletes important information and wipes out the data required to track the hackers. Much like Ransomware, it also enables the cyber criminals to get control over the entire system and manipulate the data for malicious purposes. Hackers continuously look for insecure and vulnerable networks in order to implement their attacks. Thus, in order to deal with the cyber security concerns in 2015, individuals and organizations must update their security systems regularly.